We have three parts need to understand well for starting our task. First is SD card knowledge, second is FAT , third is FatFs structure. For SD card background knowledge, I would like to introduce this article, I think it has told everything need to implement SD card driver. How to Use MMC/SDC. FatFs is a generic FAT file system module for small embedded systems. The FatFs is written in compliance with ANSI C and completely separated from the disk I/O layer. Therefore it is independent of hardware architecture. It can be incorporated into low cost microcontrollers, such as AVR, 8051, PIC, ARM, Z80, 68k and etc..., without any change. 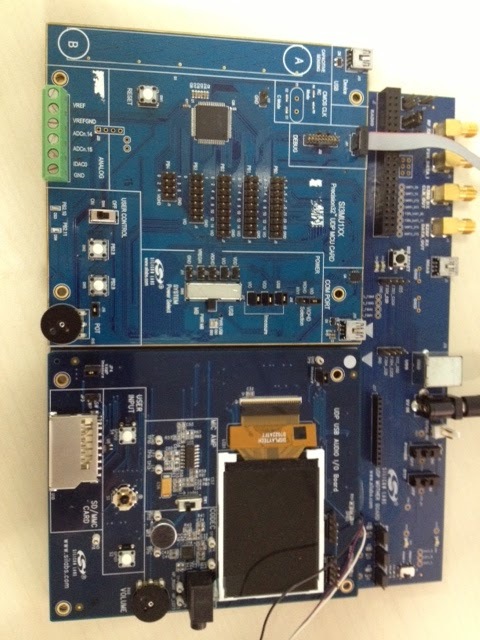 We choose one SiM3U1xx MCU card, Audio I/O board and one mother board. Here is the photo of the hardware platform. We need to understand the structure of FatFS and implement low level communication SD card driver. There is a FatFs module application note which is recommended to read first by Author. For my experience, we can go back to know more about FatFs after porting done. All files under FatFs directory like below. It doesn't contain SD card low level driver but only file system. We can get SD card simple low level driver code from \ffsample\avr\mmc.c, replace diskio.c with mmc.c . 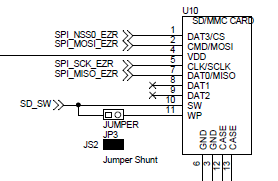 We need set correct GPIO pin as SPI, set SPI initial clock lower than 400Khz for SD card initialization requirement. And change the SPI communication code in mmc.c with SiM3U1xx SPI peripheral. In mmc.c, we have couple of functions and macros need to be replaced. OK we are done with porting job, now let start with test. We prepare simple file system test sequence. First, we read one file from SD card and print part of contents, , here we have "test.abp"; Second, we create a hello.txt file and put "Hello world!" in it; Third, we make a root directory list, it should show all files under root directory. Open an existing file (test.abp). OK, The test result shows file system works very well. We have done the porting job. Cheers!